The Concordia Self-Study Bible (CSSB) provides the older version of the NIV Bible (1984) translation with Zondervan's NIV Study Bible notes, modified by Lutheran Bible scholars. Features 10-point type. Explore introductions and outlines for each book. Reference the NIV concordance for quick identification and location of important words. Use center-column cross-reference system containing 85,000 entries that list interrelated themes, concepts and words From the Old and New Testaments. Study full-color maps of the Holy Land, timelines and charts that offer an informative overview of biblical history. Meditate on the words of Christ in red. In the Concordia version, the study notes have edits for LCMS readers and designated with a cross next to them. 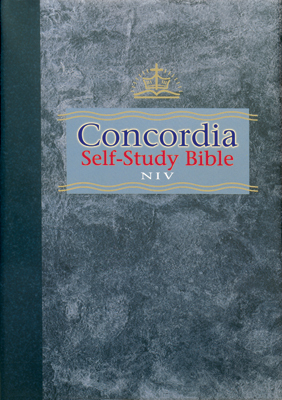 I have had a non-Concordia NIV Study Bible since the 80s and was troubled by what some of the study notes said as they did not reflect LCMS doctrine. E.g., what the elements represent in the Lord's Supper. Now, I am so happy!!!! i am happy to find an NIV that is 1984 edition. this study bible help me in my personal devotion.